Contact Sykes at Garth Morthin Dog-Friendly Barn near Snowdonia National Park on 01244 500 540 or complete the enquiry form. 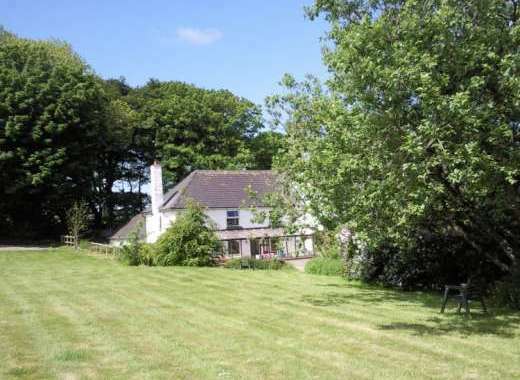 An impressive holiday barn conversion in the Welsh countryside with stunning rural views, sleeping 8 and comfortably accommodating a large family or group of friends and situated alongside one other holiday property close to the village of Morfa Bychan in Gwynedd. With a stunning contemporary interior along with a spacious light and airy sociable living space, this is an appealing place to stay. 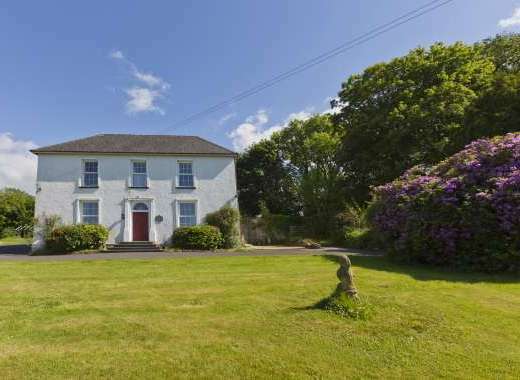 This spacious property sleeps up to 8 people and contains four bedrooms. One of the house’s best assets has to be its huge open plan living space which includes a lounge area which faces out to the in-built conservatory area and countryside and features a warming woodburning stove as well as a large TV, ample dining space and beautiful fitted kitchen. The stylish and modern feel continues throughout the property with the family bathroom, family shower room with double shower and four bedrooms. In terms of bedrooms there is a double bedroom with Juliet balcony, a standard double bedroom and two twin bedrooms. Guests also enjoy shared use of an external games room during their stay which boasts a pool table and table football. Beside the conservatory area there is a fantastic outdoor seating area supplied with furniture and a BBQ, providing an excellent place for dining outside while enjoying the rural views. There is also ample off-road parking available for up to 4 cars. There are great walking trails available from the doorstep, along with country lanes to cycle along making this a great choice for those who enjoy being active. Also within easy reach for days out is the stunning landscape of Snowdonia National Park, as well as the Snowdonia coastline. Garth Morthin makes an ideal base for big families or groups of friends looking for something special. 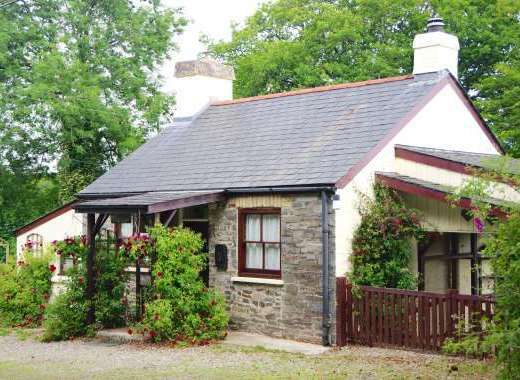 The lovely village of Morfa Bychan is situated within a short stroll of the spectacular beach at Black Rock Sands, and is home to a local store, a post office and an excellent, 18 hole golf course. 24 Apr 19 24 Apr 19 £1,195.00 Wednesday Please Contact Owner/Agency for more info. 25 Apr 19 25 Apr 19 £1,195.00 Thursday " "
26 Apr 19 26 Apr 19 £900.00 Friday " "
27 Apr 19 27 Apr 19 £1,011.00 Saturday " "
28 Apr 19 28 Apr 19 £1,011.00 Sunday " "
29 Apr 19 29 Apr 19 £1,011.00 Monday " "
30 Apr 19 30 Apr 19 £1,011.00 Tuesday " "
01 May 19 01 May 19 £1,726.00 Wednesday " "
02 May 19 02 May 19 £1,726.00 Thursday " "
03 May 19 03 May 19 £1,011.00 Friday " "
04 May 19 04 May 19 £1,805.00 Saturday " "
05 May 19 05 May 19 £1,805.00 Sunday " "
06 May 19 06 May 19 £1,520.00 Monday " "
07 May 19 07 May 19 £1,660.00 Tuesday " "
08 May 19 08 May 19 £1,660.00 Wednesday " "
09 May 19 09 May 19 £1,660.00 Thursday " "
10 May 19 10 May 19 £993.00 Friday " "
11 May 19 11 May 19 £1,694.00 Saturday " "
12 May 19 12 May 19 £1,694.00 Sunday " "
13 May 19 13 May 19 £1,554.00 Monday " "
14 May 19 14 May 19 £1,787.00 Tuesday " "
15 May 19 15 May 19 £1,787.00 Wednesday " "
16 May 19 16 May 19 £1,787.00 Thursday " "
17 May 19 17 May 19 £993.00 Friday " "
18 May 19 18 May 19 £2,642.00 Saturday " "
19 May 19 19 May 19 £2,642.00 Sunday " "
20 May 19 20 May 19 £2,362.00 Monday " "
21 May 19 21 May 19 £2,362.00 Tuesday " "
22 May 19 22 May 19 £2,362.00 Wednesday " "
23 May 19 23 May 19 £2,362.00 Thursday " "
24 May 19 24 May 19 £1,708.00 Friday " "
25 May 19 25 May 19 £2,484.00 Saturday " "
26 May 19 26 May 19 £2,484.00 Sunday " "
27 May 19 27 May 19 £2,484.00 Monday " "
28 May 19 28 May 19 £2,620.00 Tuesday " "
29 May 19 29 May 19 £2,620.00 Wednesday " "
30 May 19 30 May 19 £2,620.00 Thursday " "
31 May 19 31 May 19 £971.00 Friday " "
01 Jun 19 01 Jun 19 £1,766.00 Saturday " "
02 Jun 19 02 Jun 19 £1,766.00 Sunday " "
03 Jun 19 03 Jun 19 £1,584.00 Monday " "
04 Jun 19 04 Jun 19 £1,724.00 Tuesday " "
05 Jun 19 05 Jun 19 £1,724.00 Wednesday " "
06 Jun 19 06 Jun 19 £1,724.00 Thursday " "
07 Jun 19 07 Jun 19 £994.00 Friday " "
08 Jun 19 08 Jun 19 £1,876.00 Saturday " "
09 Jun 19 09 Jun 19 £1,876.00 Sunday " "
10 Jun 19 10 Jun 19 £1,689.00 Monday " "
11 Jun 19 11 Jun 19 £1,844.00 Tuesday " "
12 Jun 19 12 Jun 19 £1,844.00 Wednesday " "
13 Jun 19 13 Jun 19 £1,844.00 Thursday " "
14 Jun 19 14 Jun 19 £1,096.00 Friday " "
15 Jun 19 15 Jun 19 £2,021.00 Saturday " "
16 Jun 19 16 Jun 19 £2,021.00 Sunday " "
17 Jun 19 17 Jun 19 £1,814.00 Monday " "
18 Jun 19 18 Jun 19 £1,977.00 Tuesday " "
19 Jun 19 19 Jun 19 £1,977.00 Wednesday " "
20 Jun 19 20 Jun 19 £1,977.00 Thursday " "
21 Jun 19 21 Jun 19 £1,147.00 Friday " "
22 Jun 19 22 Jun 19 £2,100.00 Saturday " "
23 Jun 19 23 Jun 19 £2,100.00 Sunday " "
24 Jun 19 24 Jun 19 £1,883.00 Monday " "
25 Jun 19 25 Jun 19 £2,051.00 Tuesday " "
26 Jun 19 26 Jun 19 £2,051.00 Wednesday " "
27 Jun 19 27 Jun 19 £2,051.00 Thursday " "
28 Jun 19 28 Jun 19 £1,180.00 Friday " "
29 Jun 19 29 Jun 19 £2,312.00 Saturday " "
30 Jun 19 30 Jun 19 £2,312.00 Sunday " "
01 Jul 19 01 Jul 19 £2,088.00 Monday " "
02 Jul 19 02 Jul 19 £2,147.00 Tuesday " "
03 Jul 19 03 Jul 19 £2,147.00 Wednesday " "
04 Jul 19 04 Jul 19 £2,147.00 Thursday " "
05 Jul 19 05 Jul 19 £1,250.00 Friday " "
06 Jul 19 06 Jul 19 £2,382.00 Saturday " "
07 Jul 19 07 Jul 19 £2,382.00 Sunday " "
08 Jul 19 08 Jul 19 £2,203.00 Monday " "
09 Jul 19 09 Jul 19 £2,263.00 Tuesday " "
10 Jul 19 10 Jul 19 £2,263.00 Wednesday " "
11 Jul 19 11 Jul 19 £2,263.00 Thursday " "
12 Jul 19 12 Jul 19 £1,250.00 Friday " "
13 Jul 19 13 Jul 19 £2,525.00 Saturday " "
14 Jul 19 14 Jul 19 £2,525.00 Sunday " "
15 Jul 19 15 Jul 19 £2,347.00 Monday " "
16 Jul 19 16 Jul 19 £2,414.00 Tuesday " "
17 Jul 19 17 Jul 19 £2,414.00 Wednesday " "
18 Jul 19 18 Jul 19 £2,414.00 Thursday " "
19 Jul 19 19 Jul 19 £1,401.00 Friday " "
20 Jul 19 20 Jul 19 £3,097.00 Saturday " "
21 Jul 19 21 Jul 19 £3,097.00 Sunday " "
22 Jul 19 22 Jul 19 £2,896.00 Monday " "
23 Jul 19 23 Jul 19 £2,896.00 Tuesday " "
24 Jul 19 24 Jul 19 £2,896.00 Wednesday " "
25 Jul 19 25 Jul 19 £2,896.00 Thursday " "
26 Jul 19 26 Jul 19 £1,755.00 Friday " "
27 Jul 19 27 Jul 19 £3,451.00 Saturday " "
28 Jul 19 28 Jul 19 £3,451.00 Sunday " "
29 Jul 19 29 Jul 19 £3,451.00 Monday " "
30 Jul 19 30 Jul 19 £3,451.00 Tuesday " "
31 Jul 19 31 Jul 19 £3,451.00 Wednesday " "
01 Aug 19 01 Aug 19 £3,451.00 Thursday " "
02 Aug 19 02 Aug 19 £1,755.00 Friday " "
03 Aug 19 03 Aug 19 £3,644.00 Saturday " "
04 Aug 19 04 Aug 19 £3,644.00 Sunday " "
05 Aug 19 05 Aug 19 £3,644.00 Monday " "
06 Aug 19 06 Aug 19 £3,644.00 Tuesday " "
07 Aug 19 07 Aug 19 £3,644.00 Wednesday " "
08 Aug 19 08 Aug 19 £3,644.00 Thursday " "
09 Aug 19 09 Aug 19 £1,948.00 Friday " "
10 Aug 19 10 Aug 19 £3,566.00 Saturday " "
11 Aug 19 11 Aug 19 £3,566.00 Sunday " "
12 Aug 19 12 Aug 19 £3,566.00 Monday " "
13 Aug 19 13 Aug 19 £3,566.00 Tuesday " "
14 Aug 19 14 Aug 19 £3,566.00 Wednesday " "
15 Aug 19 15 Aug 19 £3,566.00 Thursday " "
16 Aug 19 16 Aug 19 £1,677.00 Friday " "
17 Aug 19 17 Aug 19 £3,106.00 Saturday " "
18 Aug 19 18 Aug 19 £3,106.00 Sunday " "
19 Aug 19 19 Aug 19 £3,106.00 Monday " "
20 Aug 19 20 Aug 19 £3,106.00 Tuesday " "
21 Aug 19 21 Aug 19 £3,106.00 Wednesday " "
22 Aug 19 22 Aug 19 £3,106.00 Thursday " "
23 Aug 19 23 Aug 19 £1,488.00 Friday " "
24 Aug 19 24 Aug 19 £2,535.00 Saturday " "
25 Aug 19 25 Aug 19 £2,535.00 Sunday " "
26 Aug 19 26 Aug 19 £2,535.00 Monday " "
27 Aug 19 27 Aug 19 £2,590.00 Tuesday " "
28 Aug 19 28 Aug 19 £2,590.00 Wednesday " "
29 Aug 19 29 Aug 19 £2,590.00 Thursday " "
30 Aug 19 30 Aug 19 £1,161.00 Friday " "
31 Aug 19 31 Aug 19 £2,093.00 Saturday " "
01 Sep 19 01 Sep 19 £2,093.00 Sunday " "
02 Sep 19 02 Sep 19 £2,038.00 Monday " "
03 Sep 19 03 Sep 19 £2,087.00 Tuesday " "
04 Sep 19 04 Sep 19 £2,087.00 Wednesday " "
05 Sep 19 05 Sep 19 £2,087.00 Thursday " "
06 Sep 19 06 Sep 19 £1,040.00 Friday " "
07 Sep 19 07 Sep 19 £1,890.00 Saturday " "
08 Sep 19 08 Sep 19 £1,890.00 Sunday " "
09 Sep 19 09 Sep 19 £1,841.00 Monday " "
10 Sep 19 10 Sep 19 £1,885.00 Tuesday " "
11 Sep 19 11 Sep 19 £1,885.00 Wednesday " "
12 Sep 19 12 Sep 19 £1,885.00 Thursday " "
13 Sep 19 13 Sep 19 £953.00 Friday " "
14 Sep 19 14 Sep 19 £1,773.00 Saturday " "
15 Sep 19 15 Sep 19 £1,773.00 Sunday " "
16 Sep 19 16 Sep 19 £1,729.00 Monday " "
17 Sep 19 17 Sep 19 £1,772.00 Tuesday " "
18 Sep 19 18 Sep 19 £1,772.00 Wednesday " "
19 Sep 19 19 Sep 19 £1,772.00 Thursday " "
20 Sep 19 20 Sep 19 £922.00 Friday " "
21 Sep 19 21 Sep 19 £1,622.00 Saturday " "
22 Sep 19 22 Sep 19 £1,622.00 Sunday " "
23 Sep 19 23 Sep 19 £1,579.00 Monday " "
24 Sep 19 24 Sep 19 £1,615.00 Tuesday " "
25 Sep 19 25 Sep 19 £1,615.00 Wednesday " "
26 Sep 19 26 Sep 19 £1,615.00 Thursday " "
27 Sep 19 27 Sep 19 £795.00 Friday " "
28 Sep 19 28 Sep 19 £1,495.00 Saturday " "
29 Sep 19 29 Sep 19 £1,495.00 Sunday " "
30 Sep 19 30 Sep 19 £1,458.00 Monday " "
01 Oct 19 01 Oct 19 £1,495.00 Tuesday " "
02 Oct 19 02 Oct 19 £1,495.00 Wednesday " "
03 Oct 19 03 Oct 19 £1,495.00 Thursday " "
04 Oct 19 04 Oct 19 £795.00 Friday " "
05 Oct 19 05 Oct 19 £1,529.00 Saturday " "
06 Oct 19 06 Oct 19 £1,529.00 Sunday " "
07 Oct 19 07 Oct 19 £1,492.00 Monday " "
08 Oct 19 08 Oct 19 £1,531.00 Tuesday " "
09 Oct 19 09 Oct 19 £1,531.00 Wednesday " "
10 Oct 19 10 Oct 19 £1,531.00 Thursday " "
11 Oct 19 11 Oct 19 £831.00 Friday " "
12 Oct 19 12 Oct 19 £1,757.00 Saturday " "
13 Oct 19 13 Oct 19 £1,757.00 Sunday " "
14 Oct 19 14 Oct 19 £1,718.00 Monday " "
15 Oct 19 15 Oct 19 £1,767.00 Tuesday " "
16 Oct 19 16 Oct 19 £1,767.00 Wednesday " "
17 Oct 19 17 Oct 19 £1,767.00 Thursday " "
18 Oct 19 18 Oct 19 £1,033.00 Friday " "
19 Oct 19 19 Oct 19 £2,172.00 Saturday " "
20 Oct 19 20 Oct 19 £2,172.00 Sunday " "
21 Oct 19 21 Oct 19 £2,123.00 Monday " "
22 Oct 19 22 Oct 19 £2,183.00 Tuesday " "
23 Oct 19 23 Oct 19 £2,183.00 Wednesday " "
24 Oct 19 24 Oct 19 £2,183.00 Thursday " "
25 Oct 19 25 Oct 19 £1,257.00 Friday " "
26 Oct 19 26 Oct 19 £1,718.00 Saturday " "
27 Oct 19 27 Oct 19 £1,718.00 Sunday " "
28 Oct 19 28 Oct 19 £1,659.00 Monday " "
29 Oct 19 29 Oct 19 £1,858.00 Tuesday " "
30 Oct 19 30 Oct 19 £1,858.00 Wednesday " "
31 Oct 19 31 Oct 19 £1,858.00 Thursday " "
01 Nov 19 08 Nov 19 £709.00 flexible " "
09 Nov 19 09 Nov 19 £777.00 Saturday " "
10 Nov 19 10 Nov 19 £777.00 Sunday " "
11 Nov 19 11 Nov 19 £777.00 Monday " "
12 Nov 19 21 Nov 19 £777.00 flexible " "
22 Nov 19 28 Nov 19 £738.00 flexible " "
29 Nov 19 14 Dec 19 £709.00 flexible " "
15 Dec 19 15 Dec 19 £2,203.00 Sunday " "
16 Dec 19 16 Dec 19 £2,203.00 Monday " "
17 Dec 19 17 Dec 19 £2,203.00 Tuesday " "
18 Dec 19 18 Dec 19 £2,004.00 Wednesday " "
19 Dec 19 19 Dec 19 £2,004.00 Thursday " "
20 Dec 19 20 Dec 19 £2,004.00 Friday " "
21 Dec 19 21 Dec 19 £1,543.00 Saturday " "
22 Dec 19 22 Dec 19 £2,986.00 Sunday " "
23 Dec 19 23 Dec 19 £2,986.00 Monday " "
24 Dec 19 24 Dec 19 £2,986.00 Tuesday " "
25 Dec 19 25 Dec 19 £2,986.00 flexible " "
26 Dec 19 26 Dec 19 £2,986.00 flexible " "
27 Dec 19 27 Dec 19 £2,986.00 Friday " "
28 Dec 19 28 Dec 19 £1,502.00 Saturday " "
29 Dec 19 29 Dec 19 £1,972.00 Sunday " "
30 Dec 19 30 Dec 19 £1,972.00 Monday " "
31 Dec 19 31 Dec 19 £1,972.00 Tuesday " "
01 Jan 20 01 Jan 20 £2,182.00 flexible " "
02 Jan 20 02 Jan 20 £2,182.00 Thursday " "
03 Jan 20 03 Jan 20 £2,182.00 Friday " "
04 Jan 20 07 Feb 20 £729.00 flexible " "
08 Feb 20 08 Feb 20 £1,496.00 Saturday " "
09 Feb 20 09 Feb 20 £1,496.00 Sunday " "
10 Feb 20 10 Feb 20 £1,496.00 Monday " "
11 Feb 20 11 Feb 20 £1,325.00 Tuesday " "
12 Feb 20 12 Feb 20 £1,325.00 Wednesday " "
13 Feb 20 13 Feb 20 £1,325.00 Thursday " "
14 Feb 20 14 Feb 20 £855.00 Friday " "
15 Feb 20 15 Feb 20 £1,325.00 Saturday " "
16 Feb 20 16 Feb 20 £1,325.00 Sunday " "
17 Feb 20 17 Feb 20 £1,286.00 Monday " "
18 Feb 20 18 Feb 20 £1,496.00 Tuesday " "
19 Feb 20 19 Feb 20 £1,496.00 Wednesday " "
20 Feb 20 20 Feb 20 £1,496.00 Thursday " "
21 Feb 20 28 Feb 20 £729.00 flexible " "
29 Feb 20 29 Feb 20 £746.00 Saturday " "
01 Mar 20 01 Mar 20 £746.00 Sunday " "
02 Mar 20 02 Mar 20 £746.00 Monday " "
03 Mar 20 27 Mar 20 £746.00 flexible " "
28 Mar 20 28 Mar 20 £1,951.00 Saturday " "
29 Mar 20 29 Mar 20 £1,951.00 Sunday " "
30 Mar 20 30 Mar 20 £1,951.00 Monday " "
31 Mar 20 31 Mar 20 £1,786.00 Tuesday " "
01 Apr 20 01 Apr 20 £1,786.00 Wednesday " "
02 Apr 20 02 Apr 20 £1,786.00 Thursday " "
03 Apr 20 03 Apr 20 £1,316.00 Friday " "
04 Apr 20 04 Apr 20 £2,610.00 Saturday " "
05 Apr 20 05 Apr 20 £2,610.00 Sunday " "
06 Apr 20 06 Apr 20 £2,548.00 Monday " "
07 Apr 20 07 Apr 20 £2,548.00 Tuesday " "
08 Apr 20 08 Apr 20 £2,548.00 Wednesday " "
09 Apr 20 09 Apr 20 £2,548.00 Thursday " "
10 Apr 20 10 Apr 20 £1,353.00 Friday " "
11 Apr 20 11 Apr 20 £2,055.00 Saturday " "
12 Apr 20 12 Apr 20 £2,055.00 Sunday " "
13 Apr 20 13 Apr 20 £2,055.00 Monday " "
14 Apr 20 14 Apr 20 £2,091.00 Tuesday " "
15 Apr 20 15 Apr 20 £2,091.00 Wednesday " "
16 Apr 20 16 Apr 20 £2,091.00 Thursday " "
17 Apr 20 17 Apr 20 £797.00 Friday " "
18 Apr 20 18 Apr 20 £1,620.00 Saturday " "
19 Apr 20 19 Apr 20 £1,620.00 Sunday " "
20 Apr 20 20 Apr 20 £1,583.00 Monday " "
21 Apr 20 21 Apr 20 £1,627.00 Tuesday " "
22 Apr 20 22 Apr 20 £1,627.00 Wednesday " "
23 Apr 20 23 Apr 20 £1,627.00 Thursday " "
24 Apr 20 24 Apr 20 £925.00 Friday " "
25 Apr 20 25 Apr 20 £1,708.00 Saturday " "
26 Apr 20 26 Apr 20 £1,708.00 Sunday " "
27 Apr 20 27 Apr 20 £1,665.00 Monday " "
28 Apr 20 28 Apr 20 £1,706.00 Tuesday " "
29 Apr 20 29 Apr 20 £1,706.00 Wednesday " "
30 Apr 20 30 Apr 20 £1,706.00 Thursday " "
01 May 20 01 May 20 £883.00 Friday " "
02 May 20 02 May 20 £1,796.00 Saturday " "
03 May 20 03 May 20 £1,796.00 Sunday " "
04 May 20 04 May 20 £1,755.00 Monday " "
05 May 20 05 May 20 £1,803.00 Tuesday " "
06 May 20 06 May 20 £1,803.00 Wednesday " "
07 May 20 07 May 20 £1,803.00 Thursday " "
08 May 20 08 May 20 £1,020.00 Friday " "
09 May 20 09 May 20 £1,933.00 Saturday " "
10 May 20 10 May 20 £1,933.00 Sunday " "
11 May 20 11 May 20 £1,885.00 Monday " "
12 May 20 12 May 20 £1,933.00 Tuesday " "
13 May 20 13 May 20 £1,933.00 Wednesday " "
14 May 20 14 May 20 £1,933.00 Thursday " "
15 May 20 15 May 20 £1,020.00 Friday " "
16 May 20 16 May 20 £2,719.00 Saturday " "
17 May 20 17 May 20 £2,719.00 Sunday " "
18 May 20 18 May 20 £2,671.00 Monday " "
19 May 20 19 May 20 £2,671.00 Tuesday " "
20 May 20 20 May 20 £2,671.00 Wednesday " "
21 May 20 21 May 20 £2,671.00 Thursday " "
22 May 20 22 May 20 £1,758.00 Friday " "
23 May 20 23 May 20 £2,651.00 Saturday " "
24 May 20 24 May 20 £2,651.00 Sunday " "
25 May 20 25 May 20 £2,651.00 Monday " "
26 May 20 26 May 20 £2,698.00 Tuesday " "
27 May 20 27 May 20 £2,698.00 Wednesday " "
28 May 20 28 May 20 £2,698.00 Thursday " "
29 May 20 29 May 20 £999.00 Friday " "
30 May 20 30 May 20 £1,914.00 Saturday " "
31 May 20 31 May 20 £1,914.00 Sunday " "
01 Jun 20 01 Jun 20 £1,867.00 Monday " "
02 Jun 20 02 Jun 20 £1,915.00 Tuesday " "
03 Jun 20 03 Jun 20 £1,915.00 Wednesday " "
04 Jun 20 04 Jun 20 £1,915.00 Thursday " "
05 Jun 20 05 Jun 20 £1,022.00 Friday " "
06 Jun 20 06 Jun 20 £2,037.00 Saturday " "
07 Jun 20 07 Jun 20 £2,037.00 Sunday " "
08 Jun 20 08 Jun 20 £1,989.00 Monday " "
09 Jun 20 09 Jun 20 £2,042.00 Tuesday " "
10 Jun 20 10 Jun 20 £2,042.00 Wednesday " "
11 Jun 20 11 Jun 20 £2,042.00 Thursday " "
12 Jun 20 12 Jun 20 £1,127.00 Friday " "
13 Jun 20 13 Jun 20 £2,191.00 Saturday " "
14 Jun 20 14 Jun 20 £2,191.00 Sunday " "
15 Jun 20 15 Jun 20 £2,138.00 Monday " "
16 Jun 20 16 Jun 20 £2,194.00 Tuesday " "
17 Jun 20 17 Jun 20 £2,194.00 Wednesday " "
18 Jun 20 18 Jun 20 £2,194.00 Thursday " "
19 Jun 20 19 Jun 20 £1,179.00 Friday " "
20 Jun 20 20 Jun 20 £2,278.00 Saturday " "
21 Jun 20 21 Jun 20 £2,278.00 Sunday " "
22 Jun 20 22 Jun 20 £2,222.00 Monday " "
23 Jun 20 23 Jun 20 £2,279.00 Tuesday " "
24 Jun 20 24 Jun 20 £2,279.00 Wednesday " "
25 Jun 20 25 Jun 20 £2,279.00 Thursday " "
26 Jun 20 26 Jun 20 £1,215.00 Friday " "
27 Jun 20 27 Jun 20 £2,381.00 Saturday " "
28 Jun 20 28 Jun 20 £2,381.00 Sunday " "
29 Jun 20 29 Jun 20 £2,323.00 Monday " "
30 Jun 20 30 Jun 20 £2,385.00 Tuesday " "
01 Jul 20 01 Jul 20 £2,385.00 Wednesday " "
02 Jul 20 02 Jul 20 £2,385.00 Thursday " "
03 Jul 20 03 Jul 20 £1,286.00 Friday " "
04 Jul 20 04 Jul 20 £2,452.00 Saturday " "
05 Jul 20 05 Jul 20 £2,452.00 Sunday " "
06 Jul 20 06 Jul 20 £2,391.00 Monday " "
07 Jul 20 07 Jul 20 £2,452.00 Tuesday " "
08 Jul 20 08 Jul 20 £2,452.00 Wednesday " "
09 Jul 20 09 Jul 20 £2,452.00 Thursday " "
10 Jul 20 10 Jul 20 £1,286.00 Friday " "
11 Jul 20 11 Jul 20 £2,668.00 Saturday " "
12 Jul 20 12 Jul 20 £2,668.00 Sunday " "
13 Jul 20 13 Jul 20 £2,607.00 Monday " "
14 Jul 20 14 Jul 20 £2,607.00 Tuesday " "
15 Jul 20 15 Jul 20 £2,607.00 Wednesday " "
16 Jul 20 16 Jul 20 £2,607.00 Thursday " "
17 Jul 20 17 Jul 20 £1,441.00 Friday " "
18 Jul 20 18 Jul 20 £3,188.00 Saturday " "
19 Jul 20 19 Jul 20 £3,188.00 Sunday " "
20 Jul 20 20 Jul 20 £3,188.00 Monday " "
21 Jul 20 21 Jul 20 £3,188.00 Tuesday " "
22 Jul 20 22 Jul 20 £3,188.00 Wednesday " "
23 Jul 20 23 Jul 20 £3,188.00 Thursday " "
24 Jul 20 24 Jul 20 £1,806.00 Friday " "
25 Jul 20 25 Jul 20 £3,553.00 Saturday " "
26 Jul 20 26 Jul 20 £3,553.00 Sunday " "
27 Jul 20 27 Jul 20 £3,553.00 Monday " "
28 Jul 20 28 Jul 20 £3,553.00 Tuesday " "
29 Jul 20 29 Jul 20 £3,553.00 Wednesday " "
30 Jul 20 30 Jul 20 £3,553.00 Thursday " "
31 Jul 20 31 Jul 20 £1,806.00 Friday " "
01 Aug 20 01 Aug 20 £3,595.00 Saturday " "
02 Aug 20 02 Aug 20 £3,595.00 Sunday " "
03 Aug 20 03 Aug 20 £3,595.00 Monday " "
04 Aug 20 04 Aug 20 £3,595.00 Tuesday " "
05 Aug 20 05 Aug 20 £3,595.00 Wednesday " "
06 Aug 20 06 Aug 20 £3,595.00 Thursday " "
07 Aug 20 07 Aug 20 £1,848.00 Friday " "
08 Aug 20 08 Aug 20 £3,444.00 Saturday " "
09 Aug 20 09 Aug 20 £3,444.00 Sunday " "
10 Aug 20 10 Aug 20 £3,444.00 Monday " "
11 Aug 20 11 Aug 20 £3,444.00 Tuesday " "
12 Aug 20 12 Aug 20 £3,444.00 Wednesday " "
13 Aug 20 13 Aug 20 £3,444.00 Thursday " "
14 Aug 20 14 Aug 20 £1,655.00 Friday " "
15 Aug 20 15 Aug 20 £3,127.00 Saturday " "
16 Aug 20 16 Aug 20 £3,127.00 Sunday " "
17 Aug 20 17 Aug 20 £3,127.00 Monday " "
18 Aug 20 18 Aug 20 £3,127.00 Tuesday " "
19 Aug 20 19 Aug 20 £3,127.00 Wednesday " "
20 Aug 20 20 Aug 20 £3,127.00 Thursday " "
21 Aug 20 21 Aug 20 £1,531.00 Friday " "
22 Aug 20 22 Aug 20 £3,003.00 Saturday " "
23 Aug 20 23 Aug 20 £3,003.00 Sunday " "
24 Aug 20 24 Aug 20 £3,003.00 Monday " "
25 Aug 20 25 Aug 20 £3,003.00 Tuesday " "
26 Aug 20 26 Aug 20 £3,003.00 Wednesday " "
27 Aug 20 27 Aug 20 £3,003.00 Thursday " "
28 Aug 20 28 Aug 20 £1,531.00 Friday " "
29 Aug 20 29 Aug 20 £2,492.00 Saturday " "
30 Aug 20 30 Aug 20 £2,492.00 Sunday " "
31 Aug 20 31 Aug 20 £2,418.00 Monday " "
01 Sep 20 01 Sep 20 £2,469.00 Tuesday " "
02 Sep 20 02 Sep 20 £2,469.00 Wednesday " "
03 Sep 20 03 Sep 20 £2,469.00 Thursday " "
04 Sep 20 04 Sep 20 £1,070.00 Friday " "
05 Sep 20 05 Sep 20 £1,944.00 Saturday " "
06 Sep 20 06 Sep 20 £1,944.00 Sunday " "
07 Sep 20 07 Sep 20 £1,894.00 Monday " "
08 Sep 20 08 Sep 20 £1,940.00 Tuesday " "
09 Sep 20 09 Sep 20 £1,940.00 Wednesday " "
10 Sep 20 10 Sep 20 £1,940.00 Thursday " "
11 Sep 20 11 Sep 20 £979.00 Friday " "
12 Sep 20 12 Sep 20 £1,824.00 Saturday " "
13 Sep 20 13 Sep 20 £1,824.00 Sunday " "
14 Sep 20 14 Sep 20 £1,778.00 Monday " "
15 Sep 20 15 Sep 20 £1,822.00 Tuesday " "
16 Sep 20 16 Sep 20 £1,822.00 Wednesday " "
17 Sep 20 17 Sep 20 £1,822.00 Thursday " "
18 Sep 20 18 Sep 20 £948.00 Friday " "
19 Sep 20 19 Sep 20 £1,669.00 Saturday " "
20 Sep 20 20 Sep 20 £1,669.00 Sunday " "
21 Sep 20 21 Sep 20 £1,624.00 Monday " "
22 Sep 20 22 Sep 20 £1,662.00 Tuesday " "
23 Sep 20 23 Sep 20 £1,662.00 Wednesday " "
24 Sep 20 24 Sep 20 £1,662.00 Thursday " "
25 Sep 20 25 Sep 20 £817.00 Friday " "
26 Sep 20 26 Sep 20 £1,538.00 Saturday " "
27 Sep 20 27 Sep 20 £1,538.00 Sunday " "
28 Sep 20 28 Sep 20 £1,500.00 Monday " "
29 Sep 20 29 Sep 20 £1,538.00 Tuesday " "
30 Sep 20 30 Sep 20 £1,538.00 Wednesday " "
01 Oct 20 01 Oct 20 £1,538.00 Thursday " "
02 Oct 20 02 Oct 20 £817.00 Friday " "
03 Oct 20 03 Oct 20 £1,573.00 Saturday " "
04 Oct 20 04 Oct 20 £1,573.00 Sunday " "
05 Oct 20 05 Oct 20 £1,535.00 Monday " "
06 Oct 20 06 Oct 20 £1,575.00 Tuesday " "
07 Oct 20 07 Oct 20 £1,575.00 Wednesday " "
08 Oct 20 08 Oct 20 £1,575.00 Thursday " "
09 Oct 20 09 Oct 20 £854.00 Friday " "
10 Oct 20 10 Oct 20 £1,807.00 Saturday " "
11 Oct 20 11 Oct 20 £1,807.00 Sunday " "
12 Oct 20 12 Oct 20 £1,768.00 Monday " "
13 Oct 20 13 Oct 20 £1,818.00 Tuesday " "
14 Oct 20 14 Oct 20 £1,818.00 Wednesday " "
15 Oct 20 15 Oct 20 £1,818.00 Thursday " "
16 Oct 20 16 Oct 20 £1,062.00 Friday " "
17 Oct 20 17 Oct 20 £2,141.00 Saturday " "
18 Oct 20 18 Oct 20 £2,141.00 Sunday " "
19 Oct 20 19 Oct 20 £2,091.00 Monday " "
20 Oct 20 20 Oct 20 £2,147.00 Tuesday " "
21 Oct 20 21 Oct 20 £2,147.00 Wednesday " "
22 Oct 20 22 Oct 20 £2,147.00 Thursday " "
23 Oct 20 23 Oct 20 £1,194.00 Friday " "
24 Oct 20 24 Oct 20 £1,874.00 Saturday " "
25 Oct 20 25 Oct 20 £1,874.00 Sunday " "
26 Oct 20 26 Oct 20 £1,818.00 Monday " "
27 Oct 20 27 Oct 20 £1,818.00 Tuesday " "
28 Oct 20 28 Oct 20 £1,818.00 Wednesday " "
29 Oct 20 29 Oct 20 £1,818.00 Thursday " "
30 Oct 20 30 Oct 20 £729.00 Friday " "
31 Oct 20 31 Oct 20 £1,209.00 Saturday " "
01 Nov 20 01 Nov 20 £1,209.00 Sunday " "
02 Nov 20 02 Nov 20 £1,209.00 Monday " "
03 Nov 20 03 Nov 20 £1,419.00 Tuesday " "
04 Nov 20 04 Nov 20 £1,419.00 Wednesday " "
05 Nov 20 05 Nov 20 £1,419.00 Thursday " "
06 Nov 20 16 Dec 20 £729.00 flexible " "
17 Dec 20 17 Dec 20 £2,267.00 Thursday " "
18 Dec 20 18 Dec 20 £2,267.00 Friday " "
19 Dec 20 19 Dec 20 £2,267.00 Saturday " "
20 Dec 20 20 Dec 20 £2,057.00 Sunday " "
21 Dec 20 21 Dec 20 £2,057.00 Monday " "
22 Dec 20 22 Dec 20 £2,057.00 Tuesday " "
23 Dec 20 23 Dec 20 £1,587.00 Wednesday " "
24 Dec 20 24 Dec 20 £3,074.00 Thursday " "
25 Dec 20 25 Dec 20 £3,074.00 Friday " "
26 Dec 20 26 Dec 20 £3,074.00 Saturday " "
27 Dec 20 27 Dec 20 £3,074.00 Sunday " "
28 Dec 20 28 Dec 20 £3,074.00 Monday " "
29 Dec 20 29 Dec 20 £3,074.00 Tuesday " "
30 Dec 20 30 Dec 20 £1,546.00 Wednesday " "
31 Dec 20 31 Dec 20 £2,030.00 Thursday " "
01 Jan 21 01 Jan 21 £2,030.00 Friday " "
02 Jan 21 02 Jan 21 £2,030.00 Saturday " "
03 Jan 21 03 Jan 21 £2,155.00 Sunday " "
04 Jan 21 04 Jan 21 £2,155.00 Monday " "
05 Jan 21 05 Jan 21 £2,155.00 Tuesday " "
06 Jan 21 05 Feb 21 £658.00 flexible " "
06 Feb 21 06 Feb 21 £1,381.00 Saturday " "
07 Feb 21 07 Feb 21 £1,381.00 Sunday " "
08 Feb 21 08 Feb 21 £1,381.00 Monday " "
09 Feb 21 09 Feb 21 £1,256.00 Tuesday " "
10 Feb 21 10 Feb 21 £1,256.00 Wednesday " "
11 Feb 21 11 Feb 21 £1,256.00 Thursday " "
12 Feb 21 12 Feb 21 £772.00 Friday " "
13 Feb 21 13 Feb 21 £1,485.00 Saturday " "
14 Feb 21 14 Feb 21 £1,485.00 Sunday " "
15 Feb 21 15 Feb 21 £1,485.00 Monday " "
16 Feb 21 16 Feb 21 £1,485.00 Tuesday " "
17 Feb 21 17 Feb 21 £1,485.00 Wednesday " "
18 Feb 21 18 Feb 21 £1,485.00 Thursday " "
19 Feb 21 19 Feb 21 £772.00 Friday " "
20 Feb 21 20 Feb 21 £1,256.00 Saturday " "
21 Feb 21 21 Feb 21 £1,256.00 Sunday " "
22 Feb 21 22 Feb 21 £1,256.00 Monday " "
23 Feb 21 23 Feb 21 £1,381.00 Tuesday " "
24 Feb 21 24 Feb 21 £1,381.00 Wednesday " "
25 Feb 21 25 Feb 21 £1,381.00 Thursday " "
26 Feb 21 26 Feb 21 £658.00 Friday " "